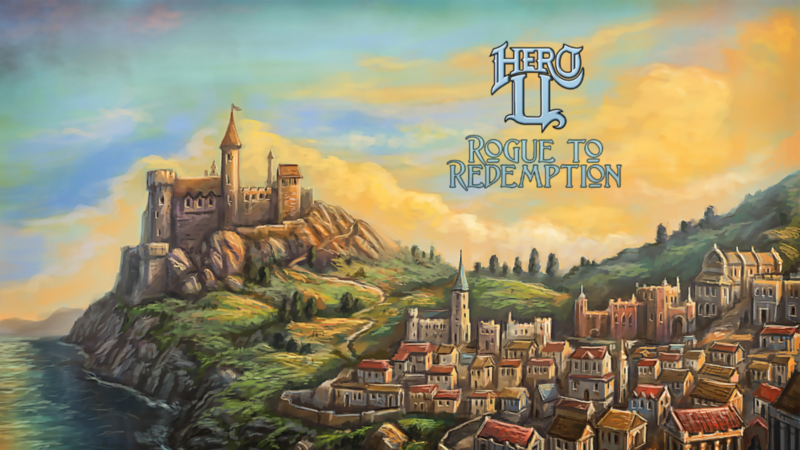 Hero-U: Rogue to Redemption is a Kickstarted game from Corey and Lori Cole, the original creators of the Quest for Glory series and I backed it the moment I heard it existed. For context about how I live my life, just about any Quest for Glory (QFG) game would surely be featured in my “if I were an island castaway and for some reason had a working computer with me” lineup. Well, maybe not Quest for Glory 5. So when Hero-U was finally released I couldn’t wait to fire it up. Nevertheless, I tempered my expectations, knowing that yes, it’s been decades since the Coles have released a game. And yes, it wouldn’t be fair to expect this to be Quest for Glory 6 in disguise. Plus it was Kickstarted, which likely means they didn’t have nearly the resources they needed or deserved in order to accomplish the things they wanted to for this game. Even so, I had high hopes. I tried. I really tried. I just don’t like Hero-U: Rogue to Redemption. The game is just so empty and aimless. 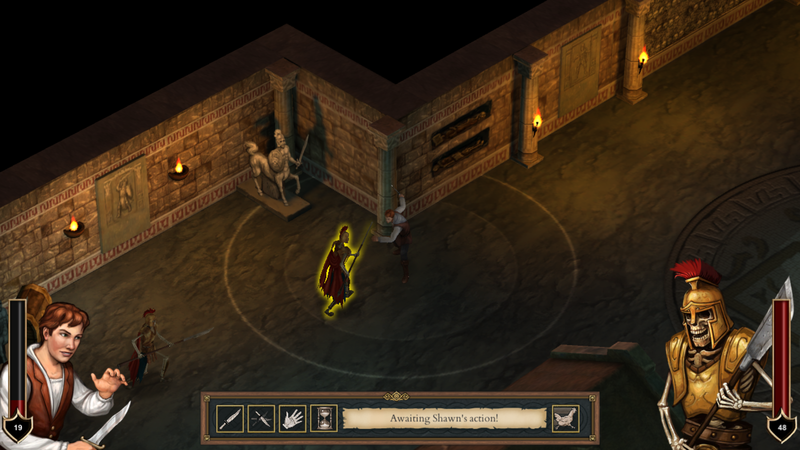 You’re playing as a character in a university for heroes, training to become a master rogue/thief/rapscallion. There are a handful of people in your class and NO ONE ELSE exists in the university. That’s not quite true, there are a handful of professors and staff but none of whom ever leave their assigned places. No one except the antagonist ever wanders the hallways. There are extremely few other NPCs to fill out the spaces. Occasionally another classmate will be out of place but that’s always tied directly to an event with them. For instance, in one event two classmates go on a date, the date goes bad, and you run into one of them out in the courtyard. She then storms off. That change in pace, seeing ANYONE out and about was so thrilling, and unfortunately that’s the low bar for this game. This is accentuated by just how big the rooms in this University are. Traversing the castle takes friggin forever, especially when you’re doing it at the classic Quest For Glory “hunched over so you can level up your stealth” pace. At first Hero-U gives you some light assignments designed mainly to get you to explore the University. “Find the library”, etc. After that, however, the game gives you no guidance or pressure really to do anything. It tells you there will be a series of exams that will occur in the coming weeks but what that means exactly isn’t defined. There will be a semester-long competition for “best rogue” (or something like that) but it’s also vague about what you’re supposed to do to get ready. Being a video game I assumed they were both a measure of your skill levels and so I spent every waking moment training. The first exam was a “written” and reading comprehension test of how well you were paying attention to the interludes with the main professor. Ah damn. 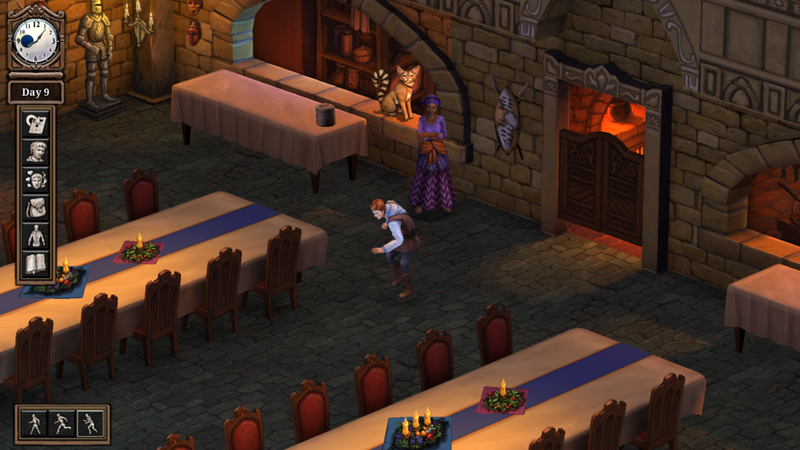 For a game about training to be a rogue, Hero-U sure doesn’t give you much room to break the rules. The university’s curfew is 10 p.m. and being caught out will earn you demerits, so of course I took that to be a demand from the game that I skip curfew. Plus, the game doesn’t leave you many hours in the day to raise skills, earn money, or interact with classmates. Sneaking out at least gives you some additional time to do so. Except, your main character gets too tired and the game sends you to bed if you stay up too late. Plus, as mentioned before, there’s really nothing new to see out in the University at night. There’s little-to-nothing to steal and the few extraneous doors you can break into don’t even get their own room to explore. I worked to level up my lockpicking skill to open this door, only to discover that it, and other doors like it, hid nothing of interest. It was at this point, about a game week in, I about gave up on Hero-U. The backlog of games I want to play is plenty huge, the Interactive Fiction Competition is ongoing and I haven’t come anywhere near the games I thought I’d play, and as usual I have too many other hobbies to nurture. But this is a game by the Cole’s! Their games defined my childhood! I kept going. Admittedly Hero-U improves a little as you get deeper into the game. There are some fun character developments and special events to engage with, though often I resorted to online walkthroughs because a lot of them were time- or location-gated with poor communication from the game about how to handle them. Meaning, that in the game you need to be at a particular place or time to trigger the next part of the event or character interaction, and unless you are there at that appointed time or place, you miss it and/or fail. 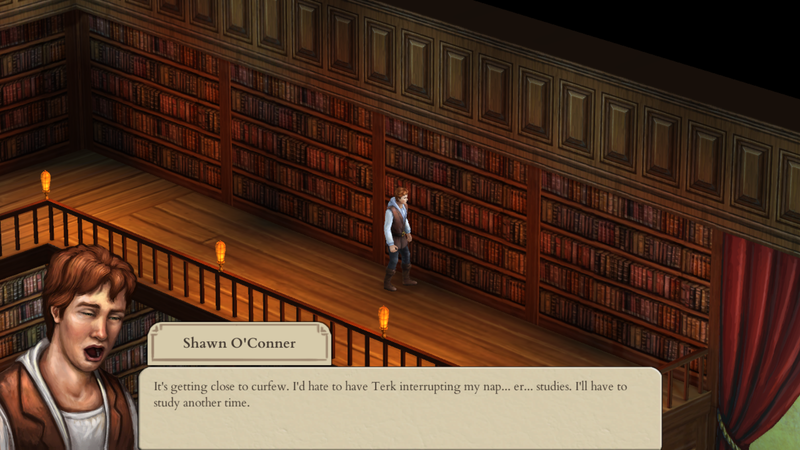 Doing so (reading walkthroughs online), destroyed most of my sense of discovery with Hero-U. But then I wouldn’t have gotten to experience these parts of the game if I hadn’t spoiled myself. Presumably this game design is meant to reward exploration and add replay value with different play styles. Here’s the thing though, Hero-U fails at truly giving you opportunities for different play styles for there just isn’t enough in the game. 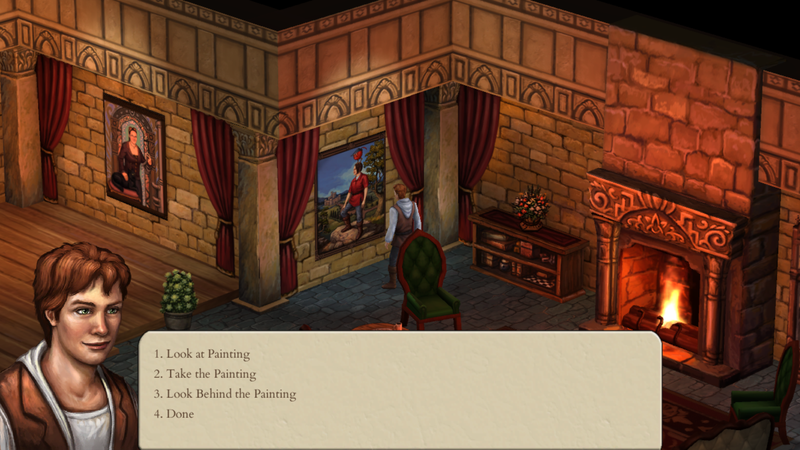 Every piece of scenery in the game has an admirable amount of descriptive text. I stuck with Hero-U through to the end as there are glimmers of good ideas and clearly a TON of writing was done for the game, but it’s utterly smothered by a failed attempt at openness. You’re in a school training to be a rogue but there are too few roguish things to do. 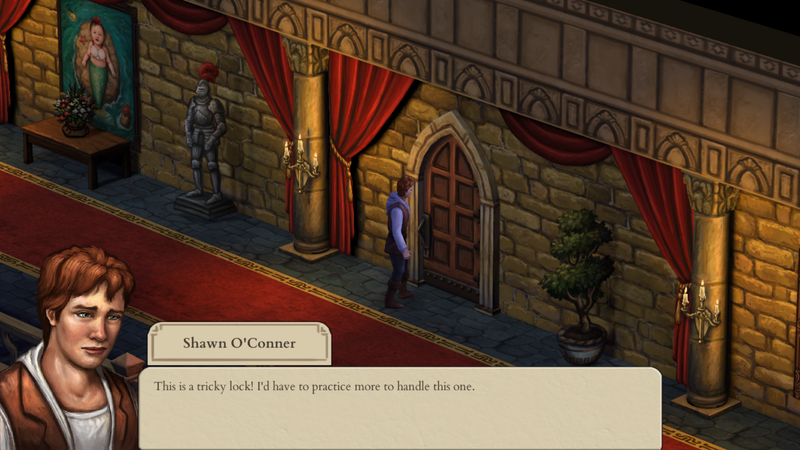 You’re in this school with huge rooms filled with hundreds of objects, each described with an astonishing amount of custom text, but the vast majority of that scenery doesn’t exist beyond their initial round of descriptive quips. You’re asked to manage character relationships, level up skills, or earn money within a tight daily schedule, but have too few challenges or rewards to justify the stress of it. Playing Hero-U is a strange juxtaposition of feeling like you’re never given enough time and feeling interminable. Hero-U needs some major structural reworking. Forget the whole “choose your own path” thing. Add more guidance and explicit goals for players. Tighten the number of days in the semester and scale the economy appropriately. Add people, ANYONE, to populate this school so it feels like an actual lived-in place. And… whew, there’s more that could fix it, but I haven’t had enough coffee yet this morning. Again, it’s not fair to expect a QFG game from Hero-U but the hints of that series in Hero-U were really the only things that kept me in it. Frankly, you’d be better off playing Heroine’s Quest or Quest for Infamy if you’re trying to get that dose of nostalgia. There’s enough in Hero-U to show that the Cole’s are still skilled game makers, but it feels like they fell into crowd-funded project pitfalls; not enough money or time for the scope of what they wanted to do. To be fair, I don’t fully know the structure of their team and who exactly contributed to the creation of this game, so my apologies if the blame or the credit is to be shifted elsewhere. However, Hero-U failed from the moment of its wire-framing. The game is structurally unsound and it really breaks my heart to say so.